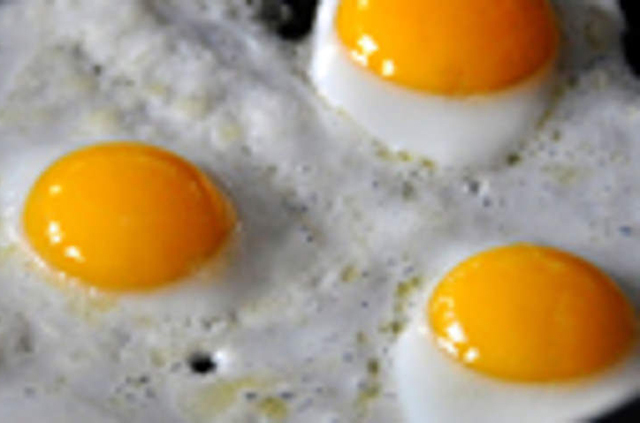 Scientists, U.S. government: Did we say eggs were bad for you — for decades? Oops! Sorry. Years ago this blog covered the U.S. government’s decision to change the food pyramid. When it turned out that the guidelines federal bureaucrats were putting out for years on what constituted a “healthy” diet were indeed a recipe for obesity, they quietly made the change and whispered in our ears, “Shhhhh. This old food pyramid never happened.” Now they’re doing the same thing as it pertains to cholesterol. People turn to personal trainers because each person is different. How your body responds to an exercise program may be very different than mine. For similar reasons, we should question the masterminds crafting laws on how much sugar, salt, fat, etc. we should eat. I’m sensitive to spicy foods, but my wife could probably down a bucket of hot peppers and not worry about it. The point is that too many people have blind faith in what nameless, faceless bureaucrats tell them instead of doing their own research and then trusting common sense to guide their decision-making. Remember the Sugar-Sweetened Beverages Tax (SWEET Act) submitted to Congress by Rosa DeLauro (D-Conn.)? For those who don’t remember, she literally wants to tax every teaspoon of sugar you consume. Why? Because she thinks she knows what’s best for you. The same goes for former New York City mayor Michael Bloomberg and a whole host of others. Growing up in the 80s, I remember teachers telling me that eggs were “bad,” and that if I ate them I should try and just eat the whites. When I told my grandmother (who lived to be 98-years-old), she just laughed and told me to eat my eggs and not worry about it. My grandmother did not know more about food science than the nutritionists working for the federal government, but I’m inclined to believe that she did have more common sense. There are millions of Americans who have made science their religion, even as they mock the spiritual faith of their friends and neighbors. Do your research. Be diligent. Take responsibility for your own life, and don’t apologize when what you determine is best suited for your health and wellness conflicts with conventional wisdom. You’ll be glad you did. Next Entry Germans cancel parade due to terror threat; honest debate on Islamic State still verboten in U.S.
Old science is constantly being proven wrong by new science, but to live your life according to that axiom is to be called “anti-science”. If there’s one thing that science has never been is settled. The old food pyramid sham should be justification enough for anyone who is disinclined to believe the government needs to take all sorts of drastic actions at the cost of civic and economic liberties to stop global warming. That’s the thing: “Global Warming” became “Climate Change.” Before “Global Warming,” scientists told us we should fear the next ice age. Heh. Even “Climate Change” is a bizarre term because no one denies that the climate changes. They might question the extent to which man has an effect on climate, but no one denies that it fluctuates over time. I also question whether or not ceding liberties to the federal government is a good “solution” to climate change, but when I do that I’m somehow “anti-science.” Not really. I just think that the giant ball of exploding gas in space called the sun, underwater volcanoes, and a whole host of other things make climate science much more complex than Leonardo DiCaprio (traveling around the world in his private jet) would have me believe. Oh yes! Great post! Those who worship science as it were something to be treated like faith actually disparage the whole idea of science in the first place. Science actually demands that it be constantly questioned, that’s what gives it its integrity. It’s just fascinating to me how time and time again scientists will change their minds on any number of issues, but yet if you are ever skeptical of the prevailing wisdom of the day, then there is an endless supply of people ready to throw out the “anti-science” smear. The Prevailing Science of the Day is just; the prevailing science of _that day_. When more information comes in theories change to accommodate that information (unless it’s ‘climate change’, then they fiddle the numbers until they get whatever answer they want). There are new questions about the Big Bang this week as well. It wasn’t that long ago that it was settled that the Big Bang happened and that the expansion of the universe was accelerating.